Police Drones filling U.S. skies: Corrupt "idea." Check out this timely article in The Los Vegas Guardian Express, "Drones to Fill U.S. Skies within 5 Years." Friends, I am sad in the deepest part of my soul that drones are already filling our skies full speed ahead with no strong opposing power able to stop this madness. The pro-drone forces are extremely powerful, backed by billions of dollars. Yet, as many can correctly surmise from the statements of Benjamin Franklin and our other Founding Fathers, the truth is self-evident: It is not worth sacrificing freedom for "security." We must question the pervasive idea of some purported "balancing act" of freedom and security. In such a "balancing act," we obviously see that phony "security" is cutting freedom's throat. But the greatest truth of it all is this: FREEDOM IS OUR TRUE SECURITY. Do not be fooled by the crony phony baloney State hijacker's version of "security." Read my book, "The STARLING Connection," for the complete proof: Ultimately the State cannot provide "security." Likewise, pervasive surveillance technology will not necessarily provide "safety." It is a terrible, dangerous fallacy to put all your faith in false comfort, the suburban myth of "perfect safety and security," to allow those on the top to exploit your fear. Friends: Love is greater than fear. We should love the truth and not be afraid. Of course, loving the truth can be very dangerous. Yet, we must ask what is the true nature of the enormous Construct we are building both here in the United States and globally? Is it really "utopia" or is it something else? I may be talking from a warrior's point of view here, but a so-called "life" of "safety and security" is a strange, unnatural kind of "life" to strive for, is it not? It stems from false beliefs, ideologies and silly creations that exist only in a person's wishful thinking. Such a "life" simply does not represent Nature/Reality. Life is inherently dangerous. Hoping for a politician's or businessman's (or party or group's) promise of "perfect peace, safety and security" is a false hope, a false faith and a false religion. Forget the ideal. Stop for a moment and think about what a "life" of "perfect peace, safety and security" would actually be like in practice? It would be the most abominable "life" imaginable in which a massive "Nanny/Totalitarian State" held everyone's hand from birth to death and never let you skin your knee. It can manifest itself in millions of people lost and trapped within an artificial Construct without meaning or growth, a pointless "living death." Ultimately, it could mean rows of skulls and mass graves such as we have seen before in mankind's "utopias." Consider the costs of a population completely controlled by a handful of corrupt human farmers who exploit fear. What are the true costs of a society fooled into the unquestioning belief that the State will provide "perfect peace and safety"? In a society with such a false "value" and corrupt mindset gripping everyone, we would not, for example, be able to field a truly effective fighting army because everyone would choose to stay home seeking "safety" and "comfort." Similarly, the ostensibly "clever" ones would stay home seeking education, status, careers and riches. No one would take to the streets to protest because the Drones will be watching. No one would speak freely because they wouldn't want to risk their "perfect comfort and safety." We would be a "society" without warriors and without human rights. The cult of "perfect safety and security" is wickedly ignorant nonsensical wishful "thinking." It stems from false conditioning, false "education," propaganda, spoiling, over-consumption, childishness, brainwashing and outright willful ignorance. Human beings have higher needs than merely "safety." We are here for a higher purpose than simply a life of "perfect peace, safety and security." In reality, every moment of our lives includes danger and change. This is the fuel for growth, for learning and what we don't know or see. But attempt to create a "perfectly safe world," and you cut off the oxygen to the tree, as well as the sunlight. Consider that the sun provides us with light and life, but a single massive solar flare could be powerful enough to take life away. Natural risk and danger is the stuff of life, not some false conception of "safety" that comes from a limited human consciousness. Any person who cannot properly understand and manage his or her fear cannot be truly free. Does anyone in our government honestly and seriously believe that the ignorant, simplistic writing "no boots on the ground" on a piece of paper in Washington, D.C. will ACTUALLY prevent boots ending up on the ground when missiles are launched after foolishly choosing sides in Syria? Friends, this is a 100 percent FALSE promise and complete nonsense/wishful thinking. This is the same nonsense/wishful thinking of the ignorant war criminals who claimed that the United States could play God in the Middle East, that through the barrel of a gun, America could, from the outside, impose its "perfect will" on Iraq, which would magically transform Iraq and "the entire Middle East" into a "free, democratic" utopia. It is the same lie that claimed the United States could somehow prevent sectarian violence which continues today. In fact, all the top-down scams and schemes over the oil in the Middle East has done nothing but lead to the situation we are facing today. Let us not forget the fact that the vast bulk of the monetary "wealth" and Earthly "power" taken by force from all the killing, death and suffering surrounding oil and the control of the global economy is not in the hands of "We, the People," in any country, but in the hands of a very small handful of corrupt human farmers who call all the shots. There is no such thing as "Arab Spring." In a manner similar to the U.S. and other states such as Russia and China with written constitutions, "elections" in the Middle East do not necessarily bring true democracy or freedom. But like Iraq, the top-down schemes, shenanigans, crimes and corruption of the profiteering warmongers at the top merely switched one dictatorship for another. The American people cannot afford to continue believing the lies, scams and top-down propaganda coming over their television sets from officialdom and from the hijackers of our State, the masters whom they serve, the world's greatest terrorists at the top who have managed to turn the State completely against "We, the People." Friends, why are so many in our government so quick and willing to jump on every war bandwagon that comes down the pike? But why are so few in our government willing to stand up and represent the single working mother stringing together three low-paying jobs just to make ends meet? Who TRULY speaks for the hard-working people in America? Who TRULY has our interests at heart? Who can we depend on to represent us? Many claim to represent us, but very few actually do. Since so many corrupt politicians in Washington are so quick to catch war fever while so few are willing to speak up for working people, I will take on the duty of speaking up. In fiscal terms, at a time when Congress is fighting over every dollar, the cruise missile show of military might was an expenditure of nearly a quarter of a billion dollars. Each missile cost $1.41 million, close to three times the cost listed on the Navy's website. Raytheon Corp. is the manufacturer of the Tomahawk Block IV, a low-flying missile that travels at 550 miles per hour. During a decade of war in Afghanistan, Iraq, and now Libya, the Pentagon has increasingly relied on the Tomahawk. A year ago, Raytheon boasted of its 2,000th Block IV delivery to the Navy. If you haven't already, I urge you (and all citizens) to read the full text of the "Military-Industrial Complex Speech, Dwight D. Eisenhower, 1961." Let me submit to you that the corrupt war-profiteers unduly manipulating decision-making in Washington, D.C. do not deserve any more money or power. Handing these psychopathic war criminals, the crony phonies and the royal families and aristocracies pulling the strings behind the scenes more of our time/labor/blood will not bring security, peace or freedom any where in the world and certainly not here or in the Middle East. They are going to have to kill me before they take another drop of my time/labor, blood, sweat and tears. I encourage everyone to fight back. Now is the time. Now is our time. In fact, I know plenty of working single mothers and plenty of other families who can make much better use of these billions of dollars than the corrupt war criminals hiding back here in the rear so they can steal everyone's time/labor/blood. It is long past time that someone somewhere speak up for our working people and take action to get the State to work for the people rather than against the people. "We, the People" cannot afford to be under State surveillance, nor can we stand to be undermined any further. I say NO MORE BRIEFCASES OF CASH FLOWING FROM CORRUPT CRIMINALS AT THE TOP HERE WHO STOLE THIS TIME/LABOR/BLOOD FROM THE AMERICAN PEOPLE, NO MORE BRIEFCASES OF CASH TO CORRUPT CRIMINALS IN THE MIDDLE EAST, CASH WHICH PAYS FOR THINGS THAT WE KNOW NOT OF, AND WHICH CAN BE QUICKLY TURNED AGAINST AMERICAN INTERESTS, JUST LIKE FOOLISHLY TAKING SIDES IN SYRIA'S CIVIL WAR. The TRUTH is NO ONE CAN SEE THE FUTURE. MANY thinking people, soldiers and veterans argue correctly that taking the side of a known enemy, Al-Qaeda, is the absolute WRONG DECISION and absolutely NOT in the best interests of the American people. Once the U.S. takes a side in a civil war and once missiles are launched, NO ONE KNOWS exactly how events will unfold, how far the war in Syria will escalate, whether or not the war will spill over across Syria's borders, how many nations will get involved/join sides, or how many more people will die in Syria and/or across the globe. Furthermore, no one knows whether a U.S. missile attack will backfire or potentially cause chemical weapons to further fall into the wrong hands. Do not be fooled by crony phony baloney tyrants in suits (wolves in sheep's clothing) claiming to be "officials" or claiming to be "representatives," speaking from an office in Washington, D.C. These crony phonies have zero credibility and nearly all of what they're claiming is nonsense. Friends, this is absolutely NOT a so-called "credibility" issue for the United States. Our country has thousands of nuclear warheads. Our country does not have a credibility issue. Likewise, our warriors and veterans who have put their lives on the line for the past 10 years do not have a credibility issue. I recommend you listen to people who have actually served in the Middle East. We all make mistakes. No one is perfect. But no individual can keep one's "credibility" when he has already lost it. If you make a foolish comment, such as "red line," which is a clear mistake, you would be wise not to add an even worse mistake on top of a mistake. Making a greater mistake will not erase the previous mistake, nor will mistake on top of mistake somehow magically create credibility or trust. Further, we must think about who exactly (or which group pulling the strings behind the scenes) was behind this kind of stepping-stone to war comment; who exactly was plotting and scheming to manufacture yet another war months ago? We must think about who may also be scheming to manufacture an unnecessary war with Iran and for what purpose? Likewise all the propaganda about "sending a message" is nonsense. It is only special interests which are served by obscuring facts and logic and muddying the public's perception about "weapons of mass destruction." Actually, "weapons of mass destruction" is probably not the best way to think about nuclear, chemical and biological weapons. A better way to think about them is to think about why exactly nations have these weapons? A better way to think about these weapons is to consider that we have not to this day seen a nation attack or invade a nuclear-armed state. It is obvious that when the U.S. invaded Iraq, both officials and the corrupt masters hiding behind the scenes, knew for a fact that Iraq did not have nuclear capability. If Iraq had nuclear capability, the 2003 invasion would likely have not happened. As far as chemical weapons, it is possible that some of these weapons could have been moved into Syria before the invasion. But if this is so, then why has our government not provided satellite photos to the public showing this movement of chemical weapons? It's possible these weapons were moved at night or under some kind of cover or disguise; however, if there were "massive amounts" of weapons, as lying officials implied, then wouldn't it be likely that some movement would have been spotted? Either way, the American people own the evidence if it exists and it is long past time for us to see the proof, if it exists, of the so-called "weapons of mass destruction," that led to the invasion of Iraq, thousands of U.S. service members killed on the battlefield, or with arms and legs blown off, or having committed suicide, the hundreds of thousands of Iraqi people who were killed directly because of the Iraq War, through the war itself, ongoing sectarian violence, economic/social disruption, hunger, disease, poverty and more. Whether or not Iraq had chemical weapons at the time of the 2003 invasion, it is a fact that is beyond doubt that Saddam Hussein did not suddenly grow 1,000 feet tall overnight and leap over the ocean to directly threaten our shores, as the lying, corrupt "officials" implied in their fear-mongering propaganda. Who exactly is the "terrorist"? I submit that there are terrorists at the top, there is such as thing as terrorism through corruption, there is systemic terrorism and State terrorism and propaganda and manipulating a State to turn it against its own people, financially, economic and socially is also a form of terrorism. Friends, turn off your television sets and talk to your friends and neighbors, people you know and trust, who have actually put their lives on the line in the Middle East. Listen to what your neighbors and veterans who have served have to say. The Middle East is like an open wound. But continuous U.S. "interventionism" and Americanizing centuries-old sectarian conflicts is like scratching the wound, sticking your fingers in the wound continuously, so that the wound is always bleeding and never has the opportunity to heal. We are paying ever more of the true costs today of past "interventions" which have NOT brought peace to the Middle East. I recognize that life is war and there will be times when we will not be able to avoid war. However, a corrupt continuous "interventionism," getting unnecessarily involved in sectarian conflicts where there is absolutely no clear, imminent, direct threat to the U.S. and which on a fundamental level are actually none of our business because these countries and cultures DO NOT belong to us, in fact does nothing but prolong and escalate warfare unnecessarily, manufacture new enemies where none were before, while making the U.S. a target when we need not be. We must begin to think beyond continuous military "interventionism" and think about what it will truly take in reality to bring a long-term, sustainable level of security to our country. The answer is not in cronyism, corruption and handing over all power to the State to put the citizenry under constant surveillance. The answer is absolutely is NOT in the myth, lies and wishful thinking surrounding this corrupt continuous "interventionism" that is being pushed by the world's most ruthless terrorists at the top of the global economy. We cannot afford to empower these war criminals even further by allowing yet another unnecessary war of choice. We must begin thinking about how to end unnecessary and counter-productive "sanctions" on other countries and how to truly liberate global trade from the world's aristocracies while empowering the working/middle class in all countries. As others have said, killing does not necessarily stop killing. Likewise, missile strikes cannot necessarily erase all the problems in the world. Missiles cannot create a perfect world. More often than not, such strikes turn out to be counter-productive and can actually backfire, prolonging warfare, adding to further destabilization, economic/social disruption, while perpetuating unnecessary suffering, disease, hunger and death. Protestors preparing to fight back tear gas attacks. Author Mstyslav Chernov, via Wikimedia Commons. Of course, no one with a human heart capable of concern and human feeling would deny the heinousness of "weapons of mass destruction," meaning nuclear, biological and chemical weapons, both their existence (in many, many countries, including our country) as well as their use to attack people. Use of chemical weapons in the world should be taken seriously and all ramifications and consequences of their use fully considered. 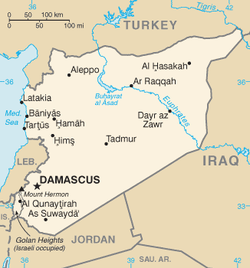 However, if chemical weapons attacks are in fact taking place within the borders of one country in the context of an uprising or civil war (or even a proxy war between Sunni Saudi Arabia and Shiite Iran), and if such attacks are an entirely (meaning full-story) legitimate, real, rational and sustainable justification for military intervention, then does this mean that if citizens rose up against the "Putin system" in Russia, and Russian "authorities" used a chemical weapon in a battle against Russian people, that the United States should then send cruise missiles into Russia? This is not such a far-fetched scenario as it might at first seem. Uprisings frequently occur in many countries and many countries have ongoing civil wars, economic, political and sectarian conflicts seething beneath the surface. What if the rulers of the single political party of China cracked down further on Hong Kong, leading to a pro-democracy uprising such as the one which occurred in Tiananmen Square, only this time around, the uprising couldn't be crushed with tanks, so "authorities" used poison gas on the demonstrators? If this were to happen, would the U.S. attack China? What about other countries? We all know that some gas is more dangerous than others, but who decides which gas is "acceptable" or "not acceptable"? Is it acceptable to use tear gas on peaceful protesters? Is it acceptable to pepper spray peaceful protesters? Such use of gas against peaceful protesters happens in the United States. In fact, as recently as 2011, a student who was sitting down, who represented no threat to any person or property, was pepper-sprayed in the face during a peaceful demonstration in California. I am not suggesting this is exactly the same as the use of gas in countries embroiled in civil war, but we must recognize in war truth is the first casualty. If our experiences with the manipulation of "facts" in the lead up to the Iraq War has taught us anything, it is this: We cannot fully trust what the powers-that-be hiding behind the current corrupt State are claiming is true. We don't know everything that is happening and much that is happening (such as the true cost) is purposefully obscured, disguised and hidden from the American people. You can't believe everything in the news media, overly reliant on "information" coming from officialdom, a fiefdom which at the end of the day represents special interests, nor can you trust what any public official, no matter how earnest, legitimate and sincere he appears, claims. So-called "clear evidence," proof, facts and the full story of what is actually happening is very difficult, if not impossible, to come by for the average American, who is working day and night just to get by. I suggest to you that our current surveillance-police State is not truly governing and has squandered much of its authority and legitimacy. It's claim that it represents "We, the People" is in serious doubt. Moreover, we, as a nation, have growing internal problems that can lead to greater problems and chaos globally. These are very dangerous times. We are shortchanging ourselves as Americans if we are not in the least concerned about the increasing manner in which widespread peaceful protests in America, particularly those following the so-called "Great Recession," protests of legitimate concerns and grievances, are now being increasingly crushed in a top-concentrated, heavy-handed and highly organized manner under the guise of "Homeland Security." Who exactly controls "Homeland Security"? In whose hands is this now-massive so-called "security" apparatus? The last I checked, Americans in fact have the right (paid for with the blood of our fighting men and women) to peacefully protest. Remember that old saying, "I may not agree with what you say, but I will defend to the death your right to say it." In fact, we soldiers, in good faith and youth, signed up to put our lives on the line because our government told us we would have the opportunity to defend "democracy," "rights" and "the Constitution." But over time, through our experiences with the wars in Iraq and Afghanistan, wars surrounded by enormous propaganda, lies, manipulation of facts, exploitation of events, fear-mongering and half-truths coming from the top down and from puppets in the highest offices in the land, more and more of us who put our lives on the line for what we believed was "We, the People," have come to question who we were really working for (who do you serve?) and who is actually in control of our country? As a citizen and as a veteran, I am deeply concerned about the reality that the American people have virtually no voice and no say in when we, as a nation intervene, go to war or get involved in entanglements which have the very real potential of spreading into regional, or even global, war. We must ask what will happen if in response to a U.S. attack on Syria, Iran engages in military action, which could draw in Israel and potentially Russia or China? Is it truly wise to unnecessarily involve ourselves in centuries-old sectarian warfare, or to escalate or prolong such warfare through continuous intervention? At the very least our officials should give up on one-sided propaganda that insults the intelligence of the American people and stop insisting that warfare in the Middle East is about "democracy" or "saving people from chemical attacks," when the truth is that the instability in the Middle East is rooted in ongoing war over the world's oil reserves and who controls the global market. I am also very concerned about the vast, ever-growing centralization of power in this country and the growing militarization of our civilian police forces. There is a reason why the civilian police force in a democracy or a Republic is supposed to be a separate, distinct and different force than the military forces, and I don't accept or support any use of pepper spray or any other gas against peaceful protesters who are doing no harm or threat to life or property. The official claim students or other protesters "must be immediately dispersed even if it means the use of gas" because they're blocking a path is ludicrous. We should consider that protest is legal, legitimate and necessary for us to have a healthy country, and it may do our country some good to slow down for a minute, question the status-quo and to think a little deeper about the underlying issues our nation must deal with. Would it not be hypocritical of the U.S. to intervene in Syria and then not to intervene if similar events happen within the borders of one of our "allies" or "trading partners"? Who stands to gain from military intervention in Syria and who stands to lose more of what we've already lost? In 1988, thousands of people were reported to have been killed and many others injured in a poison gas attack on Halabja, a Kurdish city in northern Iraq. This was during the Iran-Iraq War, and officialdom considered Saddam a U.S. "ally" at that time, a bulwark against Iran dominating the region, so nothing was done. It was not until the 1991 Gulf War after Saddam invaded Kuwait that Saddam went from "ally" to "enemy." However, the so-called "regime-change, nation-building, coalition" intervention in 2003 to topple Saddam under the preposterous "New American Century" thinking of the war architects who believed they could play God and re-create the entire Middle East as some kind of utopian "democratic paradise" that would forever serve our interests in fact led to the strengthening of Iran. Consider there is now a Shiite government in both Iran and Iraq, continued violence, corruption and instability in Iraq, as well as vast unrest from Egypt to Libya to Afghanistan and Pakistan, across the Middle East. Are we (meaning the working people here in America) not now paying more and more of the full price and true costs of our interventions? Is it prudent at this time to intervene (meaning drag ourselves into another ongoing war) yet again, at a time when we are already overburdened by the debt and costs of the wars in Iraq and Afghanistan? As of this writing, the outstanding public debt, according to the U.S. National Debt Clock, stands at $ 1 6 , 7 4 2 , 1 0 3 , 8 1 1 , 3 0 4 . 6 3. The clock breaks it down as follows: "The estimated population of the United States is 316,539,541 so each citizen's share of this debt is $52,891.03. The National Debt has continued to increase an average of $2.04 billion per day since September 30, 2012!" Who in reality will shoulder the true costs and burdens of this massive debt for generations to come? Who is pocketing all of the money, wealth and power and who is losing everything? As we see clearly and obviously, intervention over the years has done nothing to stop warfare in the Middle East, but has only served to increasingly destabilize the region, while dragging America down, both economically and militarily, and dragging us (forcing us to return) into the region forever. Are we going the way of the Soviet Union, which collapsed shortly after its own fiasco invading/occupying Afghanistan? On top of these issues, the growth of warfare in the Middle East, including the growth of global drone warfare, has in fact served to unduly empower the world's greatest terrorists, those corrupt profiteers at the top who are willing to sell their souls, and build a corrupt system (an artificial god) which forces others to do the same, and to sell out America, those profiting from the evil, destructive, out-of-control, unmanageable and unaccountable growth of the surveillance-police State here at home. These criminals/terrorists have hijacked our country and are literally burning the Constitution in order to make a quick buck off their next surveillance camera and drone. The surveillance-police State does nothing to bring about real, sustainable, long-lasting security for the American people, but does everything to empower the most corrupt, ruthless and wicked at the top who already possess far too much power and control over our nation and the world. Don't get me wrong, I am not advocating impossible isolationism. I am actually advocating REAL (broader and more diffuse global) trade with all countries, just as I am advocating REAL trade here at home in terms of diffusion of power and the citizenry being able to own their own lives and own businesses. I am asking the basic question is it not time to end unofficial wars and sanctions which do not work (entrenching the powers at the top of the countries under sanctions and causing unnecessary suffering of the working poor of those countries), end this never-ending quick and unnecessary continuous interventionism that does not serve the interests of "We, the People," trade with all countries not actively engaged in invading other countries, bring down the price of oil, a global commodity, through liberalizing its trade on the global marketplace, pay our true costs and debts and do what is necessary to ensure stability in our own country, meaning creating a diffusion of power and equal opportunity here in the United States? There is an alternative, a far better, more rational and sustainable manner in which to increase the level of security of our nation. Is it not arbitrary and hypocritical for the U.S. to allow some people in the world, such as Kurds, to be gassed, while it intervenes for others? Who gets to be the fortunate ones who receive "justice-seeking" intervention and who exactly decides this? Are the military interventions we have undertaken over the past several decades truly rational and legitimate, or are they in reality, meaning in the overall context of world history, completely arbitrary, decided by the whims of whoever is in power at the time and what those in power can gain for themselves from such interventions? Continuous interventionism of this sort in reality makes the nation weaker, because it makes us not the nation that "walks softly but carries a big stick," but the nation that uses its stick to go into areas of the jungle that it has no business in, to bash anything that moves, thus breaking the stick off bit by bit until there is nothing left. In the real world, power is limited by Nature-Reality, will and resources; therefore, overuse/unnecessary use of power leads to the decline of power and less availability of power when truly needed. These are all very important questions that every American should be asking BEFORE supporting any use of military force. We should not forget fiascos such as "Blackhawk Down" in Somalia and fiascos (meaning the trillions of dollars lost and thousands of American lives and hundreds of thousands of other lives lost, uprooted, hungered and diseased of the fiascos of the Iraq and Afghanistan wars). 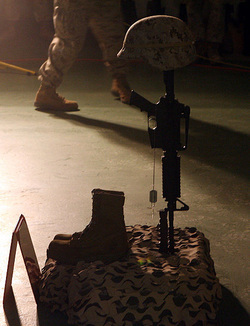 We must not forget that force in any form, like any action, has profound, long-lasting, multi-generational consequences, including unknown, unforeseen and unintended consequences, a reality which a relatively small group of Americans who have put their lives on the line know firsthand via our experiences in the wars in Iraq and Afghanistan. We are already paying a terrible price for past interventions, and to this day no one knows the full costs and consequences, nor what will happen tomorrow from the seeds we have sown over the past 10 years. Consider that at this moment a young boy who has lost his family to a drone attack is coming of age in Pakistan. Consider this young boy may one day become the next dictator of that nuclear-armed country. Do not be fooled by corrupt officials who constantly talk about "security" (security for whom exactly?) or so-called "precision weapons." Do not be fooled by those who serve hidden interests and who claim that these wars have no lasting, long-term costs. No matter what they claim out of both sides of their mouths, our corrupt politicians as well as the masters they serve (the vast majority of whom in fact NEVER served this country in battlefields overseas) have absolutely no knowledge of what will result from their quick, ill-thought and corrupt continuous interventionism. I have a quite a few hard questions of my own which I have been asking since setting my boots on the ground, along with others among our fellow countrymen who put everything on the line, in Iraq in 2003. These are questions which have been burning holes in my mind ever since. I continue to think about these questions every day and to sort them out as best as I can as both a citizen and as a writer. When it comes to military action abroad, I strongly urge my fellow citizens to ask the hardest questions you can think of. And then keep asking some more. It helps to turn off the television sets when fully considering these questions. As you ask these hard questions, talk to people whom you know, those who have truly earned your trust and, particularly, those veterans who have truly earned your level of rights on the battlefield. You may be asking much better and deeper questions than I am asking, so please share your thoughts and questions with me. Let's learn together. It is my deepest hope that by asking questions and demanding answers that we, as Americans, can come together to bring about a government that is truly "of, by and for" "We, the People." What is the true cost, in terms of time, energy, labor, lost opportunity costs and most important of all, blood, to the average citizen of military action which has the very real potential of leading to a far longer and deeper military engagement or, even a regional or new world war? Will the sons and daughters of the aristocracy be the ones who are dying on the battlefield? Or will 99.9 percent of the people dying on the battlefield as a matter of fact be the sons and daughters of the working poor? What does this situation of unequal and unshared costs and burdens mean to all Americans and to the fate of our nation? Should Americans support any military action that is taking place within the current vastly corrupt and sad state of affairs in America, in which the American people are now being constantly watched in a wholly unlawful, un-American, anti-Constitutional, and criminally EVIL assault/act of violence by the State, a corrupt "system" in which our nation's youth are being sold out into lifelong debt slavery to the big banking cartels, an uncivil "society" that has burned its social contract in which the vast majority of Americans who work for wages have virtually no representation by their "government"? Could it be possible that the rush by the powers that be at the top to intervene (this time) in Syria (and get "We, the People" to pay 100 percent of the true costs for it) might be tied in with a desire to distract the American people from the high crimes of constant surveillance, debt/wage slavery and worse? Whose interests are being represented by the ever-increasing military-surveillance industrial and prison-pharmaceutical industrial complexes? Who exactly calls the shots? What exactly gives anyone the right to call all of the shots, particularly those who never paid the true price or costs on the battlefield for our levels of freedom? Is it "We, the People" who call the shots, or is it a mere handful of a handful of the people who hold all the cards in the casino, ensuring the "house always wins"? Who exactly is hiding behind the Pied Piper who continues to manufacture warfare and lead the people into yet another unnecessary "military intervention"? Is it truly a "free market"? But why is it so difficult for the average American to own their own business? Why is our so-called "tax system" thousands of pages, costing the economy billions and dragging down the nation into another level of hell? Are "free elections" in this country real, or is it merely an illusion, a so-called "choice" between Coke and Pepsi? If "elections" are real, then why does nothing fundamentally change in reality? Why does the nation appear to be on the false and wicked trajectory of only one agenda, the agenda of those with already far too much concentrated power? Why does nothing fundamental change, no matter who is elected? Have you, the average citizen, not noticed that no matter who is elected, military intervention of choice and wars of choice continue, under every justification under the sun, while the surveillance-police State continues to increase relentlessly? If "elections" are real, then why do the modern day plantation owners and human farmers who (according to most studies) own nearly 50 percent of the nation's wealth, including the vast military-surveillance/prison-pharmaceutical complexes, ever increase their scope, size and power, while the working people forever work themselves further into the poorhouse? Why is the purported "free market" only for people who can already afford it, while everyone else is shut out and all of the true costs are thrown onto the backs of the working poor? Which is the true war? Is it a war against "terrorism" abroad, as officialdom claims? Or is the real war the war against the vast global terrorism that millions here at home and billions across the Earth are terrorized under every day? What benefit is it to anyone for anyone to "conveniently forget" that wage and debt slavery, as well as a poor or low level of public education, is also a form of financial and economic terrorism? Why do our nation's working poor suffer and shoulder all the true burdens and costs of each and every day in their daily battles to pay our rent, buy milk and food and support our families? Why does our corrupt State appear to be hell-bent on undermining us while we are fighting overseas, so that we return home to a so-called "Great Recession" and no jobs that pay living wages, while the corrupt "system" undermines working people at home from before we are born until the day we die, making our lives ever harder? What are the true, root causes of the so-called "war on terror"? Is the never-ending "war" against "terrorism" caused within and rooted in the Middle East, as officialdom claims, or is the real war, meaning its root causes, actually taking place right here in the United States? Are the American people in fact being terrorized by a corrupt entity/mindset (call it lack of discipline over our own greed, hyper-consumption, infantilization of adults, too much dependency on/undue faith in the State or those controlling it, or wishful thinking) that is hiding out in the rear behind our blood soaked flag, along with his wicked servants, his puppets and Pied Pipers fooling the people by donning the mask of "democracy" and "freedom," while playing the sick propaganda songs of yet another foolish, corrupt and ill-thought "military intervention"? What is the true role of any nation in the world? Or are "nations" no longer real? Is global oligarchy and global technologically/systemically enabled master-slavery far more powerful and far more real than any "nation," an ever-more powerful and ever growing global single "system"? Who owns this global "system"? Where will this global "system" lead us to? Why should any poor or working person, who gains nothing from it and who pays with our time, energy, labor and blood the true costs, support it? Can or should any nation, or global system, no matter how "powerful," attempt to play the role of God in the world, including the clearly failed attempt to re-create the Middle East in our image? Why does this failed and insane attempt to play God in the Middle East continue? Is it truly to fight "terrorism" or to "save people" from chemical attacks, as heinous as those attacks are? Or does it have everything to do with who has the power to control the world's wealth, including its oil wealth? Isn't the real war the war about who gets enough power to be the Earth's greatest terrorist this time around? Is humanity indeed following in the footsteps of World War I and World War II, a direct path to self-destruction, or is there some way that humanity can one day evolve beyond the current primitive master-slave construct? Is there a way in which a human being can live as a truly free consciousness on the face of the Earth, as neither a master, nor a slave? I recently read an interesting article titled "A+ for Finland" (Smithsonian, September 2011), written by Lynnell Hancock. The article contains many interesting ideas regarding an education philosophy built on a solid foundation of self-evident truths and common sense fundamentals. "If you only measure the statistics, you miss the human aspect." Much of my novel, "The STARLING Connection," is devoted to the question: What exactly is education? The other question the novel deals with is: Whose interests are served or should be served in an education system? In "The STARLING Connection," which is set in the U.S.A. of the year 2045, teen protagonists Simon Laramie, Jaya Ceyes, Flower Wildwind and Peter Arnold are fighting for their human rights (including their right to privacy, their right not to be bullied and their freedom to speak). These kids are also fighting for their right to a more full education, an education that is equal to the education the powerful receive in private schools. The "education" system in the novel is characterized by a misguided over-reliance on purportedly "advanced computerized intelligence testing," 2045's updated version of "standardized testing." The teens, who deal every day with the school's often cruel realities, see through the mask of "objectivity." Far from being "objective," the so-called "intelligence testing," is used like a razor sharp knife by the powerful to artificially slice students off into different "education groups," providing the children from the more privileged, connected family backgrounds with more opportunities to learn at school. Statistics are easily manipulated to rationalize a rigid system of caste and institutionalized violence. “You can’t measure a human being,” Jaya says. Only Nature knows the full extent of reality and the deepest essence/potential of humanity and of any individual human being. The depths of this ocean of knowledge cannot be fully revealed by any surface "test" devised by the limited consciousness of man. It is self-evident that "standardized testing" does not equal education; such testing should not falsely consume the entire focus of school, nor should it be overly relied on as a primary yardstick, and perhaps not used to any great extent at all, particularly with young children. The true test of whether or not any education system is working is what is happening in the real world in the real lives of people, meaning whether or not the people as a whole have the ability, knowledge and power to experience higher levels of freedom/human rights. This knowledge, the knowledge that on a fundamental level no one can measure a human being, should be the cornerstone of any true education system, meaning well-rounded education that is focused 100 percent on helping all children and on learning for the sake of learning, on teaching students how to enjoy lifelong learning; and thus, what is critical for the citizenry as a whole, how to ask the hard questions and how to think critically for themselves in order to truly own their own lives. They (the children) had just returned from their regular 15 minutes of playtime outdoors between lessons. "Play is important at this age," (Maija) Rintola (20-year teacher) would later say. "We value play." Teachers in Finland spend fewer hours at school each day and spend less time in classrooms than American teachers. Teachers use the extra time to build curriculums and assess their students. Children spend far more time playing outside, even in the depths of winter. Homework is minimal. Compulsory schooling does not begin until age 7. "We have no hurry," said (Kari) Louhivuori (veteran teacher and the school principal). "Children learn better when they are ready. Why stress them out?" The second critical decision came in 1979, when reformers required that every teacher earn a fifth-year master's degree in theory and practice at one of eight state universities -- at state expense. From then on, teachers were effectively granted equal status with doctors and lawyers. Applicants began flooding teaching programs, not because the salaries were so high, but because the autonomy and respect made the job attractive. Applicants began flooding teaching programs, not because the salaries were so high, but because autonomy and respect made the job attractive. In 2010, some 6,600 applicants vied for 660 primary school training slots, according to Sahlberg. By the mid-1980s, a final set of initiatives shook the classrooms free from the last vestiges of top-down regulation. Control over policies shifted to town councils. 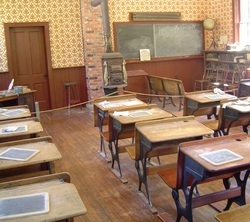 The national curriculum was distilled into broad guidelines. National math goals for grades one through nine, for example, were reduced to a neat 10 pages. Sifting and sorting children into so-called ability groupings was eliminated. All children--clever or less so--were to be taught in the same classrooms, with lots of special teacher help to make sure no child really would be left behind. The inspectorate closed its doors in the early '90s, turning accountability and inspection over to teachers and principals. "We have our own motivation to succeed because we love the work," said Louhivuori. "Our incentives come from the inside." What do you think of the ideas expressed by the teachers in Finland who are quoted from the Smithsonian article? Do you think these are good ideas that can work in the U.S. or other countries, or do you not think these ideas are over-simplified and not workable? Why or why not? What is your take on the current state of education in the U.S. Do you believe that the current system is serving the best, long-term interests of young people in our country as a whole, or is our current system serving other interests? In what areas are our schools successful, in your view, and in what areas could we improve? What are your specific ideas/plans for reform? I am interested in hearing different points of view and new ideas, so feel free to comment on this post and share it with your friends so they can comment. Teachers and those with direct experience in education are encouraged to comment/share thoughts, feelings and ideas. Theodore Webb is the author of "The STARLING Connection," a novel-series about a near-future drone-filled Dystopia in which a group of teenage "hackers" fight for a more full education that is equal to the education the powerful receive in private schools. Webb is the author of several short stories, including "Desperate Engine" and "Family Hour." His electronic books and stories are available on Amazon.com and Smashwords.com. Webb regularly blogs at http://www.theodorewebb.com. "Like" his Facebook author page,http://www.facebook.com/theodorewebbauthor and follow him on Twitter at Theodore Webb @ STARLINGCONNECT. 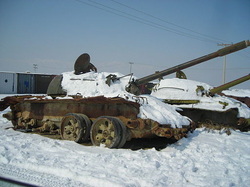 Remnants of Soviet tanks in Afghanistan. Believe me when I say anyone’s society can appear quite different when you’re gazing back at it from across the seas thousands of miles from home. Imagine if the Soviet Union had been conducting drone warfare, crossing the sovereign borders of Pakistan. Would the United States have stood for this? Would this have been acceptable or unacceptable? 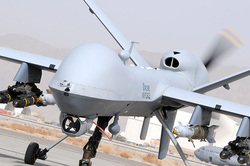 If global drone warfare had been on the rise during the Cold War, could this not have sparked World War III? Today it is convenient for many to believe that the trappings of the Cold War have completely "disappeared" or that a new global war couldn't happen. But the truth is wars often don't end, but boil under the surface of every society. Much nuclear weaponry is still intact in Russia and other powerful States. Up and coming States are growing more powerful through trade imbalances, have more powerful weaponry than before and are advancing. Contrary to propaganda, it is States, as well as changes in global balances of power, which pose a far greater threat than individual terrorists or groups of terrorists. Why exactly is it acceptable today for the State to send countless drones with no true accountability across Pakistan’s borders? Who or what exactly controls these drones? Who exactly is in control of the State and our massive top secret surveillance complex that is going rogue and has become dangerously unaccountable to "We, the People"? What master does this Goliath surveillance-military-prison industrial complex serve? Is it truly in the interests of "We, the People" to further increase the size, scope and power of the surveillance-police State? What Pandora’s Box does this never-ending expansion open up? More importantly, does the expansion of drone warfare abroad and the expansion of the surveillance-police State at home truly make "We, the People" more secure, as the high priests of the State claim? Or is this expansion nothing more than self-fulfilling prophecy? Does terrorism exist independently like a ghost, ready to strike out of nowhere with no rational basis in reality, as the State claims, somehow haunting us outside of our own artificial master-slave constructs and ever larger unaccountable and irresponsible "systems"? Or, when you closely examine these claims of the State, do these claims not in fact on some level feed, agree with and support the same fear that terrorists hope to promote? When examined closely and truthfully, without the kind of propaganda we see on Corporate-State television, do not the lines between the State and the terrorist begin to blur? Are massive global constructs in fact in and of themselves a form of terrorism creating ever more crime and terror within our society and across the world? Who is holding those at the top accountable? Should those at the top be permitted to get away with every State-enabled scam under the sun, building false "systems" of injustice against "We, the People" ever larger? If any one of these questions has even a single ounce of truth, then we must face the reality: In the tunnel vision of the State and its officialdom, there is no end to the so-called "Global War on Terror" and no end of wars such as those in Iraq and Afghanistan. It is obvious there are people with questionable motives within our society who will keep any "war" going in perpetuity in order to line their pockets at all costs. No one knows the actual, real levels of threat, and if anyone did know, then he or she (particularly those at the top and in officialdom) wouldn't tell anyone the truth, but purposefully bend it to enrich themselves and their cronies. In reality, no matter what the threat level, the corrupt salesman never sleeps for the dangerous master he serves, constantly selling the vast expansion of the surveillance State which costs "We, the People" billions upon billions for new cameras, body scanners, computer systems and so on. And there are many hidden costs of this so-called "post-9-11 system." Likewise there is no end to the "war"-surveillance-drone-building profiteering that has taken place since 9-11. What exactly have "We, the People," including our children and grandchildren, received in return for all our money and debt that is passed off onto our shoulders? This massive, highly questionable war-"profiteering"-driven complex, tremendous amounts of money pocketed by only a handful of our society, has not in reality made us more "secure," but LESS secure. We MUST recognize what is going on in reality and see it for what it is and for what it is costing us. The costs are too high, my friends. Our liberty and human rights, given to us by God-Nature, are NOT FOR SALE, PERIOD. Which country shall the so-called "Global War on Terror" lead us to invade and occupy next? Are we already at war with more countries? Is economic warfare also a form of warfare? Again, exactly who pays the true costs? "We, the People" pay, not only with our sacrifices on the battlefield, but with higher costs of gasoline, with higher costs to eat, pay our rent and simply live. Yes, we must have a Defense Department which should help to protect the interests of "We, the People." I’m not saying otherwise. Our fighting men and women are important and necessary. Warriors, and others like us, are often under-appreciated, taken for granted and misunderstood. I will always love, respect and stand by my brothers and sisters who, like me, came from the bottom of this society and who served in uniform beside me in dangerous places. I don’t claim in any way, shape or form to be any different than any other veteran who went overseas and did his or her duty as we were trained for and understood our duty to be at the time. I don’t claim to speak for any other veteran. I can only speak for myself. I can only speak to what I learned on a deep, personal level from my experience in Iraq. This experience made me feel somewhat alienated and separated from many of my countrymen upon returning home, meaning those countrymen caught up in the external aspects of life here, who didn't seem to know a war was going on, or even care. But the experience of being overseas also brought me much closer to all of the world’s people, and helped open my eyes fully to the truth that we are all brothers and sisters, no matter what we look like or what culture we come from. In reality, what happens to one person in any part of the world happens to all people all over the world. What I came to understand through the Iraq War and through everything else in my life is quite different from the so-called “national conversation,” myths, fairy tales and outright lies that far too many of our countrymen blindly believe in and accept without questioning deeply enough. Where is the real national debate? Where is the discussion, the conversation? Why is everyone hiding their heads in the sand and moving along with their lives as if nothing is happening that's undermining "We, the People" completely? Over time, what I’ve learned is a far cry from what most of us were taught in public school. It’s also quite different from the grand illusion of the so-called “two-party system,” or the rigid ideologies that purport to answer every one of life’s questions. Many of these same folks, still believing they are “free,” build ideological houses with no doors and no windows. They believe only in their beliefs. And what is worse, they put all their faith into a person, or one man, or a group of people. They join "cults of personality," putting pictures of politicians they've never met on their refrigerators beside photos of their family. But it is extremely dangerous to put all of your hope and faith into false "messiahs" and the promises of the State. Belief in belief is dangerous. Better to fight for and suffer for a wider knowledge and understanding and pay the true price. No true cost can truly be passed on to others in reality. Too many are also far too afraid and far too willing to hand over everything our fighting men and women have fought for to the State, meaning a few people at the top who are controlling the State and using the State to advance only their interests at the expense of everyone else. The interests of the State are in fact NOT the interests of “We, the People,” but are the interests of whichever group of gangsters, thieves and terrorists which has hijacked the State. Every society has such a group and no society is "exceptional" in this regard. It is the group at the top which the State actually serves, the aristocracy, often its the thugs, gangsters, thieves and criminals at the top of the corruption. In our "system," the group which has managed to strong arm its way to the top are those falsely “profiting” from so-called “bail outs,” financial tyranny and the blood of our brothers and sisters in arms. The State often does not serve “We, the People.” The State and "We, the People" are two different things. 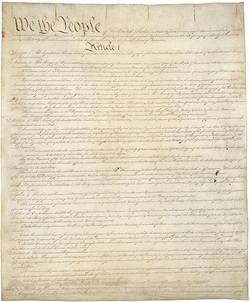 The Bill of Rights is intended to protect the private sphere and the rights of the people. If one right, such as "We, the People's" fundamental human right NOT to be watched by the State, goes by the wayside, then all of our rights go by the wayside. Too many people falsely believe that "freedom is free" and take for granted the level of rights that our World War II veterans and others have helped us to achieve. We're lost in wishful thinking and put false faith into human-manufactured constructs such as the current State. We have lost sight of "self-evident" truths and are lost as a nation. Can we find ourselves? Can we, as a people, find our True North?